Chelsey Whan’s sweet penalty corner finish propelled Domore to their second ever women’s Irish Hockey Challenge title as they edged out Clonmel at Serpentine Avenue 1-0. 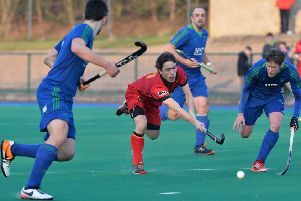 The Challenge – formerly the May Costley Cup – is Irish hockey’s most unpredictable competition and Dromore became the tenth different winner in the last 10 years, adding to their success in 2008. The interchanges between Emma Wilson, Hannah Buchanan and Emer Melville were causing problems but they kept running into defensive brick walls with Betty Barlow a key figure in shutting them out. And, on the break, the Tipperary outfit did have their moments with Jill Shanahan the focal point of their attack. She raced through and turned on a six-pence to open up a shooting chance but it flashed wide of the right post. The pick of the Dromore openings came two minutes before half-time but Ana Clarke could not get full force behind her shot and the confident Jenny O’Brien booted clear, leaving it 0-0 at half-time. The second half followed a similar pattern with Dromore holding most of the play with their forward triangle causing problems but Susan Meaney’s side were resolute in their task. From there, they looked the more likely to kick on and make the game safe until the last five minutes when Clonmel produced a rousing volley of attacks with plenty of long balls wreaking havoc. And they thought they had their equaliser from their sole penalty corner. It was switched to the injector by Barlow to Maeve Murphy who struck crisply first time but Eve Hughes brilliantly got across to save with her knee.